"Everything is falling apart...it's all just going B...A...D!" Those were the words of my 9-year-old as we struggled to pull our things together to get out the door by 7:15 a.m. this morning. I must admit, part of me agreed. A lot of the varying pieces of the morning felt a little ragged, all over the place, and just plain BAD to use E's words. It was just one of those ramble shamble, can't quite get out the door on time mornings. Kids have a way of speaking the plain old truth sometimes, don't they? I mean, I know they can be dramatic (believe me, I have 3 girls, I KNOW they can be dramatic! ), but sometimes truth is truth. This morning truth was truth. 5:30 a.m. Mom gets up, fixes a cup of coffee, reads her Bible and journals for a few minutes. This is supposed to help me start my day on a positive note! 6:15 a.m. Mom starts to make lunches and pack her own bags because she is heading out of the house for the day to work on some freelance and writing projects at our office space (a temporary space that we've been renting, but are giving up at the end of this month). 6:30 a.m. A and E (my 11 and 9 year old) and Dad wake up. 6:30-7:15: We make lunches, pack bags, make breakfast, get dressed, take vitamins, get out the door. 7:15: A, E and mom get in the car, drive to school. Usually they take the bus at 7:13 a.m., but A had a morning meeting and it was leaf raking day at the school, so she needed to take a rake, which obviously requires a ride in the mini van because bus drivers aren't so keen on rakes on the bus. 7:30-8:30: Scott finishes getting Aubs ready for school and on the bus. I should point out that this isn't our everyday routine. I do try to get out of the house before 8 a.m. one day a week to work on my writing/freelance projects so that I can put a whole day of work in and be available for the girls when they all get home at 3:45. My needing to get out of the house early with the big girls did add some extra stress this morning, but the reality is that many of the hiccups this morning are issues we often deal with whether I'm trying to get out of the house early or not. As it turns out, we actually hit most of our time markers... the breakdown was in the in-between, and our lack of preparation the night before. The breakdown is always in the in-between, isn't it? It's like looking at a family photo with everyone smiling. That's what is supposed to happen... in theory. But, what actually happened in the moments before and even the time in-between each photo? I bet you ALL have a story about that. The in-between is always where the real story is. 5:30 a.m. Mom gets up, makes some coffee, reads her Bible and journals for a few minutes. 6:15 a.m. Mom starts to make lunches, and pack her own bags because she is heading out of the house for the day. 6:30 a.m. A and E (my 11 and 9 year old) wake up. (All of this happens, but not without stress. It's about 7:07 a.m. when E starts to lament that nothing is going quite right...she can't find matching socks, she can't find a warm fleece (because it's now Fall and she needs something warm to wear for leaf raking day), her backpack isn't completely packed...I totally understand how she feels, I'm kind of feeling that way myself. At this point I'm also feeling like I should get a bad mom award for not having gotten everyone's cold weather stuff out of the basement sooner, not sorting the socks over the weekend, and not making more effort to make the morning run more smoothly. We do get into the car at 7:15 (though honestly we should have left 5 minutes sooner to make it to school for Ava's 7:30 meeting on time). Even though I'm feeling a little frayed from the last 45 minutes, and I'm also rushing through traffic, I know I need to say something positive. I gaze over at the girls, my big one next to me in the front seat, E behind us in the back. I let out a laugh/smile/what the heck just happened look. Listen girls," I say, "Being upset over how crazy our morning was isn't going to help anything. Let's talk about the things we could have done differently and make a plan for them." "So, I ask, "What were some of the problems?" I don't really give them time to answer...Mom is on a mission to sort this out verbally. "E, your socks... Could we make sure we have matching socks the night before?" "And your lunches. I love making your lunches, but could use some help. If you guys could pack your chips and snacks the night before, that would help as well, right?" "My stuff...I know. I could have prepared my own bags sooner and had them by the door." "The rake," Ave chimes in. "I could have gotten that out last night." We all nod in unison. We go through a list of other things that would be helpful; making sure to sign permission slips at night, filling water bottles (which we usually do), knowing which shoes they need, making sure they have their gym clothes, library books, etc. "Girls, I'm sorry. I've tried to start these routines before, but I haven't done a good job following through either. Here's the thing. I could use your help following through. Can we all try this together for the rest of the week?" We all agree. We feel hopeful. Phew...It's hard to believe that so much commotion and emotion can happen within the first hour of the day sometimes, isn't it?! Honestly, our crew, we're not always the most disciplined bunch, we know routines are good for us, but struggle to implement them. Then you throw in the variables-- Aubs waking up in the middle of the night, the leaf raking episode, the mis-matched socks-- the next thing you know, molehills have become mountains to our morning. Dear Lord, Thank you for this day. This IS the day that YOU have made and we WILL rejoice and be glad in it. I pray that you would go before us, be with us, and behind us in all that we do today. I pray that you would bless the girl's day and the work of their hands. Give them focus and wisdom. Help them to be a light to all they come into contact with. In Jesus Name We Pray, Amen. After I dropped them off I still felt a bit flustered about the events of the morning. Mom life is tough stuff in the most mundane ways sometimes (Dad life too!). There are a lot of moving pieces, and as Scott has often said, it's like we're trying to hit a moving target some days. Despite all of that, there is action that can be taken to make things easier and more manageable, and I need to be more consistent in doing those things. I'm feeling a renewed sense of determination to establish a rhythm for the family that works for all of us-- sometimes that means implementing new systems, sometimes that means letting go of old ways of thinking and bad habits. I'm ready to do both. I also realized that the most important part of what had happened this morning was not the "bad" stuff, but the conversation in the car-- the part where we came together, offered conclusions, and prayed for the rest of the day. We all needed to remember that while our morning hadn't gone as planned, today was still the day that the LORD had made-- that there was beauty to be found in the ashes of our morning shenanigans. That it gave us an opportunity to discuss how we could make things better and that there was SO much of the day left to unfold. 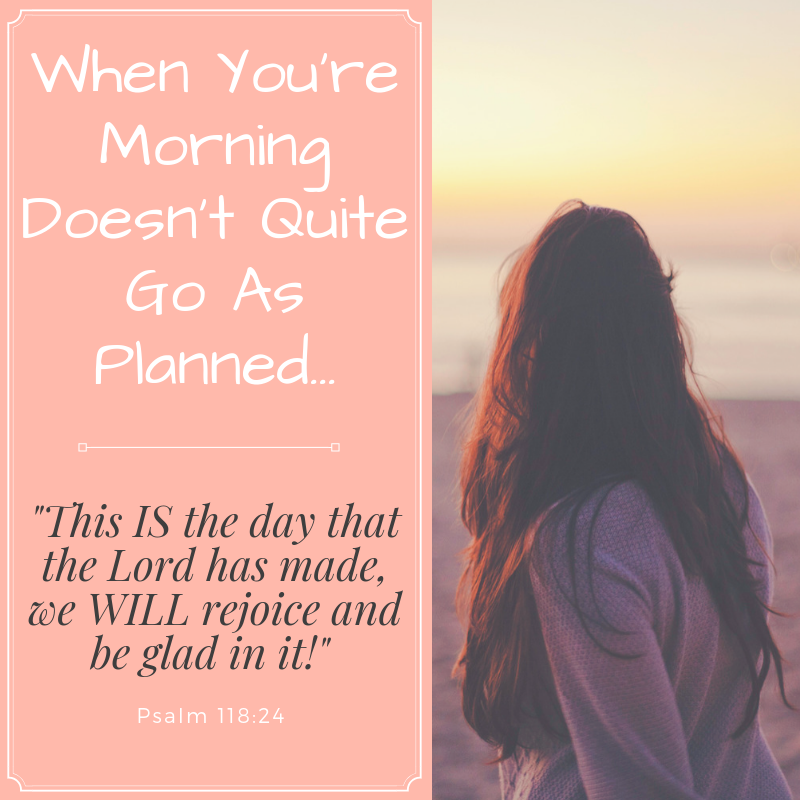 By letting the distraction of a less than ideal morning keep us from seeing what else the Lord might have in store for the day is undermining the gifts and lessons that God may want to bestow on us for the rest of the day. We needed to remember, and even declare, that He has made this day, that He is going to fill it with blessing, and that He wants us to invite Him into our family routines, our comings and goings, and even our shortcomings. Let's declare it one more time, "This IS the day that the Lord has made. We WILL rejoice and be glad in it." I hope sharing this story encourages someone today-- to be ok with what isn't, to be ok with what is, to look forward with expectation to what can be...as we ask, seek, and pray over all of it.